M.H. 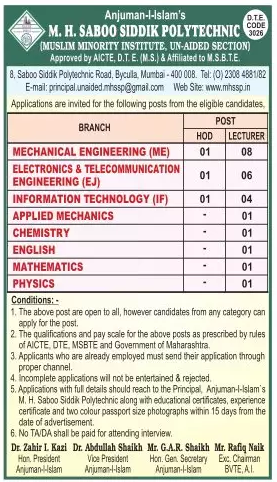 Saboo Siddik Polytechnic, Mumbai has advertised in LOKSATTA newspaper for the recruitment of Lecturer plus HOD job vacancies. Interested and eligible job aspirants are requested to apply with in 15 days. Check out further more details below. About College: The Mohammed Haji Saboo Siddik Institute (a Minority Institute) owes its existence to the munificence of the late Mohammed, son of Haji Saboo Siddik, who bequeathed a large sum of money for establishing, conducting and managing the Institute for imparting Vocational, Technical and Industrial Training and Education. The value of the assets, so bequeathed, has grown phenomenally into assets worth crores of rupees.introSubsequently, when the concept of technical high school took shape, a sum of Rupees One Lakh was also received from the assets of his mother, Bai Jimba Bai, after whom one of the buildings has been named in the premises of the Institute.